Below are some frequently asked questions that may help our patients and their family members learn more about our services. 1. Who is Visiting Physician Services? Visiting Physician Services, founded in 1994 by Dr. Jon Salisbury, is a doctor-based practice that makes house calls to elderly and homebound patients. We are dedicated exclusively to making house calls and do not see patients in our office. We operate the same as an office practice except our doctors come to your house. We make house calls to private residences, senior housing buildings and assisted living facilities. 2. What is VPS' relationship with the VNA Health Group? In 2015, VPS joined forces with VNA HealthGroup to better serve our patients and expand the breadth of services that are available to you and your loved ones. Visiting Physician Services' administrative office is located in Holmdel, New Jersey. We serve patients in Ocean, Monmouth, Middlesex, Somerset, Union, Essex, Passaic, and Bergen Counties. Our doctors and clinical staff work in geographic teams within each of these counties so that we can be responsive to you and the area in which you live. 4. What type of physicians do you have? Our doctors are board certified in family practice and/or internal medicine and gerontology with extensive experience in adult and geriatric care. Our medical staff also includes physician assistants and nurse practitioners who are board certified and expertly trained in providing the highest level of care for the elderly or homebound patient. 5. Can I still see my regular physician? While our doctors do work closely with your physicians and specialists in managing your care, we do recommend that you utilize one doctor as your primary care physician. We would be happy to come out and make a house call visit, however, it's typically in your best interest to have one primary care physician. 6. What if I have to go to the hospital? If you need to be admitted to the hospital, Visiting Physician works closely with a team of admitting physicians to ensure seamless continuity of care. We stay in close contact with your admitting physician so that we can monitor your care and progress. 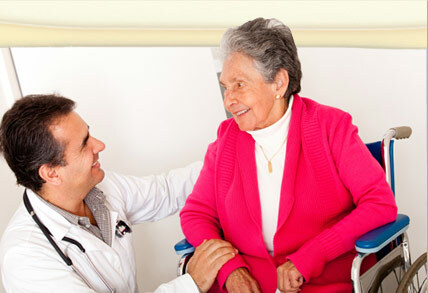 Our doctors will resume care once you are discharged from the hospital or rehab facility. 7. What can I expect during a house call visit? Your initial visit includes a complete physical examination, assessment of your surroundings, monitoring of your nutritional status and taking a full medical history. We also perform blood tests, electrocardiograms (EKGs) and arrange for X-rays if needed. After your first visit, we will continue to monitor your care and condition and will schedule follow-up visits as medically necessary. 8. Can you arrange for a visiting podiatrist or medical equipment? Yes. Visiting Physician works closely with other home care specialists including dentists, podiatrists and optometrists as well as medical equipment supply companies. We can also arrange for physical therapy, visiting nurse services and hospice care as the need arises. We prescribe and monitor your medications, making adjustments as necessary to ensure proper medication management. 10. When should I call a visiting physician? 11. Do I have to be seriously ill in order to have a house call? No. If you have difficulty or challenges getting to the doctor's office, you can call Visiting Physician. We can manage all your healthcare needs from minor ailments and serious illnesses to chronic conditions in your home. 12. Are house calls covered by insurance? Visiting Physician Services accepts traditional Medicare and Horizon Managed Care for their services. Patients or their supplemental insurance are responsible for the 20% not covered by Medicare. Private pay is also accepted. Simply call our office staff at 732-571-1000 between 9:00 am - 4:30 pm to schedule an appointment. Most appointments are scheduled for the next business day. We make house calls Monday through Friday. If you or someone you know is homebound and has difficulty getting to the doctor, Visiting Physician can help. To schedule an appointment or for more information, please call 732-571-1000.